We buy a lot of fruit. Most of the time it gets consumed. Other times I pick it up and begin leering at it, wondering if it’s aged so much that it is going to sprout a limb or two …or possibly leer back at me in return. This would be a splendid time to make ginger pear sorbet. Sorbet, when pronounced (“sore-bay”) sounds condescending, but really it’s just: water, a bit of sweetness, and grumpy, saggy old fruit that is about to turn on you because it can’t stand the neighboring young, plump fruit that just moved into the fruit bowl. It knows what’s coming. I love pears. 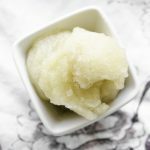 They are probably my favorite fruit, so I honestly didn’t wait until the pears were overripe to make ginger pear sorbet. They almost never look perfect, but a few scars here and there adds personality. Who wants a flawless, smooth, perfectly round, juicy pear who hasn’t seen the world and is full of old stories about its journey from its homeland? Okay, maybe everyone. I digress, my point is that you should not judge a pear by its cover. Peel the skin and each one is juicy, and soft with a slightly gritty texture. After you have peeled the pears and sliced them (tip: I use an apple corer), microwave them for three minutes, stir, then microwave for another three minutes. If you happen to have soft pears on hand, you might be able to skip this step. The purpose is to soften them so that they do not leave chunks in the blender. 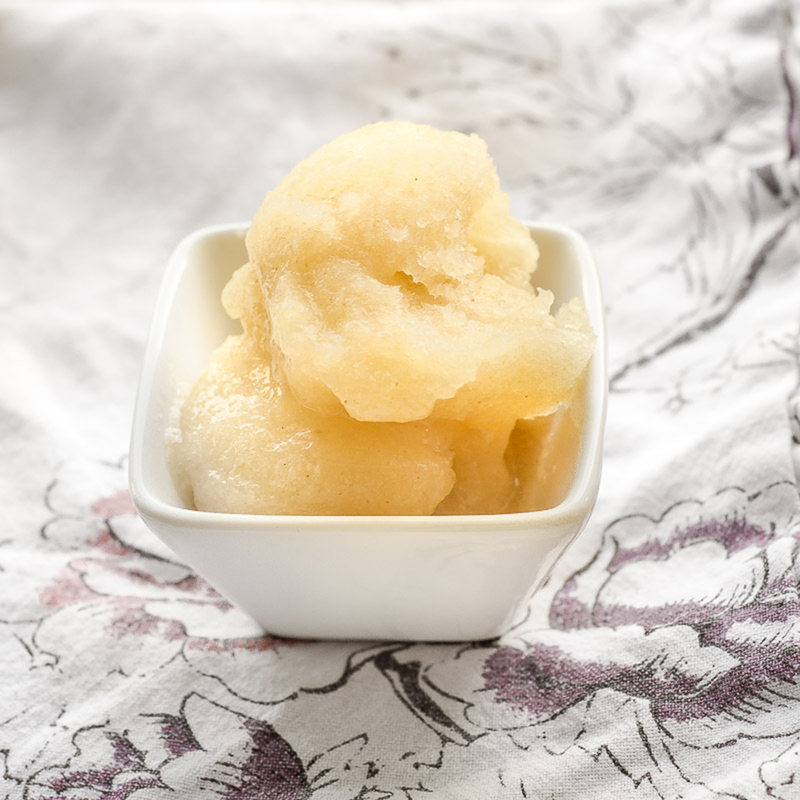 Who knows, chunks in your sorbet might be your thing. After you have done this, place them in the freezer for a wee bit while you work on making the “simple sugar.” Take equal parts water and sugar, heat it until the sugar dissolves, and then allow it to cool. This next part is simple. 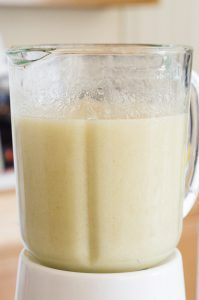 All ingredients go into the blender: the simple sugar (see above), pears, lemon juice, and ginger. I used ground ginger since I’d just run out of fresh, but I bet the taste would really brighten if you used grated fresh ginger. I would double the amount of fresh ginger if not using ground. Blend for 30 seconds to a minute and pour it into a metal pan or an ice cream maker if you have it. I used a pan since I haven’t found our ice cream maker since we moved nine months ago. Cover it in the freezer and leave it be for a few. Freezing for 4-8 hours should do the trick. Stir it every couple hours if using the pan method. When it’s ready to serve, take it out five minutes prior to give it time to soften. An iced treat of ginger spice and sweet pear. In a small pot on medium heat make the simple sugar by combining the water and sugar and stirring until dissolved. Remove from heat and allow to cool. Peel the pears and slice (tip: Use an apple corer for pears too). In a microwave-safe bowl cook the sliced pears for three minutes, stir and cook an additional three minutes to soften. In a blender, combine the simple sugar, softened sliced pears, ground ginger, and lemon juice. Blend for at least 30 seconds. Pour the contents of the blender into a metal cake or loaf pan (or use an ice cream maker according to manufacturer's recommendations), cover with foil, and freeze for four to eight hours. Check every two hours and stir. Take out five minutes to soften prior to serving.